Includes: bra, belt, skirt, wrist cuffs, necklace, anklets, half-circle chiffon veil. 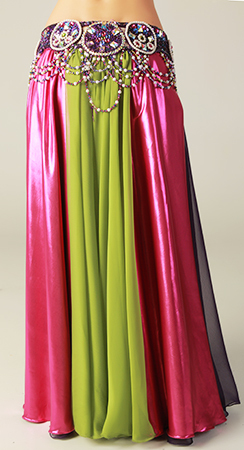 Fabric: purple velvet, metallic pink lycra and purple and green chiffon. Beading: multicolor and milticolor and AB stones. Bra: small C cup. 34" from end to end under bust. Belt attached to the skirt: one-piece belt, 37" from end to end (currently set to 34"). Skirt: double layer full chiffon skirt with two slit in front and pink and green panels. Length: 39".